Featured amenities include a business center, limo/town car service, and express check-in. A shuttle from the airport to the hotel is provided for a surcharge (available 24 hours). Featured amenities include a business center, express check-in, and express check-out. Event facilities at this hotel consist of conference space and a meeting room. A roundtrip airport shuttle is provided for a surcharge (available 24 hours). Take advantage of recreation opportunities such as a nightclub, or other amenities including complimentary wireless Internet access and gift shops/newsstands. Additional features at this hotel include a hair salon and tour/ticket assistance. 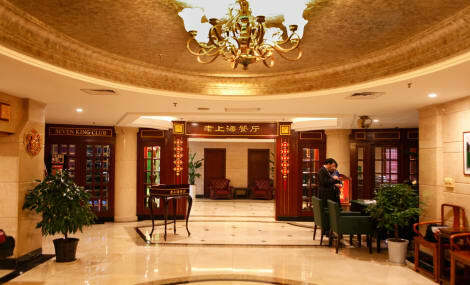 Convenient location, close to Hongqiao International Airport, high-speed rail station, Metro Line 2 & 17 connected to city landmark.Easy access to National Exhibition and Convention Center (Shanghai).Modern guest rooms and two-room suites with complimentary WiFi.500 square meter flexible meeting space for events and weddings with up to 200 guests.Shuttle bus service to Shanghai Hongqiao International Airport T2 and National Exhibition and Convention Center (Shanghai).Local attractions & popular shopping areas such as Qibao Town, Bailian Outlet Plaza Qingpu, just nearby.